Last year Campaign Monitor merged with Emma and Delivra to create a new Campaign Monitor Brand. The global email marketing company now proudly promotes their three products as one family. Through the three products—Campaign Monitor, Emma, and Delivra—the merger created a full range of email solutions to help marketers create meaningful, lasting connections with their audience. Campaign Monitor: This market-leading self-service brand focuses on delivering a better experience compared to freemium brands, with a primary focus on high volume email senders trying to drive more engagement with subscribers. With it’s easy to use marketing tool, marketers are able to send beautiful, targeted newsletters to grow their business. Shane Phair is the CMO of Campaign Monitor. 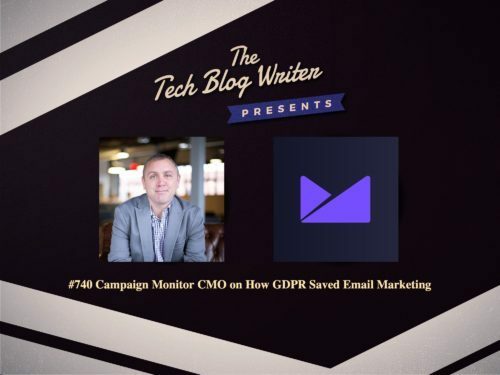 While, unsurprisingly, GDPR has presented challenges for Campaign Monitor, the company firmly believes that this development has actually saved email marketing. I invited Shane onto my daily tech podcast to talk about how engagement levels have been affected following GDPR, as well as their overall customer growth. We also discuss trends around what works and what doesn’t work when sending targeted newsletters to grow their business along with the challenges and opportunities in email marketing. I also ask what bad habits marketers should retire in 2019.